West to Present on Biologics Trends at InnoPack Pharma Confex | West Pharmaceutical Services, Inc.
EXTON, Pa., May 30, 2017 /PRNewswire/ -- (Booth #B-3) -- West Pharmaceutical Services, Inc. (NYSE: WST), a global leader in innovative solutions for injectable drug administration, today announced that it will deliver a presentation on best practices for improving patient outcomes through integrated containment and delivery systems on June 1, 2017 at the 6th Annual InnoPack Pharma Confex in Mumbai, India. West's presentation at InnoPack will conclude a week-long series of educational seminars and activities in India focused on trends and best practices in biologic drug delivery. Taking place May 29 – June 2, 2017, West's Biopharma Week 2017 includes scientific seminars in Bangalore and Hyderabad and in-house educational workshops with pharmaceutical and biotechnology customers in Ahmedabad, in addition to its presentation at InnoPack Pharma Confex in Mumbai. West's experts in integrated containment and delivery systems will share market insights and discuss industry trends, challenges and solutions for the safe and effective containment and delivery of injectable biologics and biosimilars. "Biosimilars are one of the fast-growing segments in India and fill an important need for advanced and affordable targeted therapies. These sophisticated, and often sensitive molecules, also present unique challenges in drug containment and delivery," said Troy Player, Vice President and Managing Director, Asia Pacific, West Pharmaceutical Services, Inc. "For years, West has worked by the side of its customers in India and around the world to help bring biologics, biosimilars and other innovative injectable therapies to patients. We look forward to sharing our scientific insights with biopharmaceutical manufacturers throughout India as part of West's Biopharma Week 2017." June 1, 2017, 10:45 a.m. – 11:15 a.m. This presentation will discuss trends in biologic drug delivery, including the transition to biosimilars, key factors to consider when selecting a containment and delivery system and best practices for improving patient outcomes through integrated containment and delivery solutions. SmartDose® platform—a wearable, subcutaneous injector with an integrated drug delivery system that incorporates human factors and usability testing to deliver a truly patient-centric approach to self-administration. SelfDose™ patient-controlled injector—an off-the-shelf delivery system that is ergonomically designed for optimal patient administration. A range of administration systems—including devices for reconstitution, transfer and delivery. NovaPure® components—high-quality components for higher-volume pre-filled delivery systems designed using Quality by Design (QbD) principles to reduce particulate and ensure consistency of delivery. Daikyo Crystal Zenith® cyclic olefin polymer—a high-performance alternative to glass and an integrated lifecycle solution for containment and delivery systems designed to help maintain drug safety, purity and efficacy from development through to commercialization. West has an unmatched global footprint, serving customers from more than 50 locations around the world, including a manufacturing facility in India's Sri City Special Economic Zone. Opened in 2014, West's Sri City facility produces components and seals used in the primary packaging of injectable medicines manufactured by pharmaceutical and biopharmaceutical customers throughout the Asia Pacific region. For more information on West products and services please visit booth #B-3 at InnoPack Pharma Confex or visit us online at www.westpharma.com. West Pharmaceutical Services, Inc. is a leading manufacturer of packaging components and delivery systems for injectable drugs and healthcare products. Working by the side of its customers from concept to patient, West creates products that promote the efficiency, reliability and safety of the world's pharmaceutical drug supply. West is headquartered in Exton, Pennsylvania, and supports its customers from locations in North and South America, Europe, Asia and Australia. West's 2016 sales of $1.5 billion reflect the daily use of approximately 112 million of its components and devices, which are designed to improve the delivery of healthcare to patients around the world. 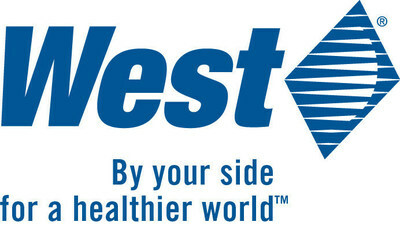 West, the diamond logo, SelfDose™ and NovaPure® are registered trademarks of West Pharmaceutical Services, Inc., in the United States and other jurisdictions. SmartDose® is a registered trademark of Medimop Medical Projects Ltd., a subsidiary of West Pharmaceutical Services, Inc. West seeks partners for its SmartDose and SelfDose drug delivery technology platforms. These platforms are intended to be used as an integrated system with drug filling and final assembly completed by the pharmaceutical/biotechnology company. Daikyo Crystal Zenith® is a registered trademark of Daikyo Seiko, Ltd. Daikyo Crystal Zenith technology is licensed from Daikyo Seiko, Ltd.